When GM slapped a Cadillac face on its popular Tahoe/Yukon, it created an ostentatious status symbol in the long tradition of Cadillac. With the new generation, improvements in finish, exterior and interior styling are more befitting a vehicle commanding a premium price. 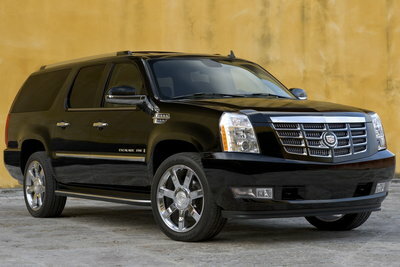 The Escalade ESV is the longer wheelbase version of the Escalade adding some 14 inches in length. The added length improves the usability of both the 3rd row seat and the cargo area. Power is provided by a 400hp, 6.2L V8 mated to a six-speed automatic transmission. All-wheel-drive is standard. The Escalade adds side thorax air bags to the front seats. A USB interface is added to the center console. A new battery saver mode shuts off power when accessories drain the battery.